Tucked amidst the crowded landscape of Beechmont Avenue, a gem of unmatched rarity has remained a fixture of the Ohio Valley for nearly two centuries. The Athenaeum of Ohio, home to Mount St. Mary’s Seminary, has been a feature of Cincinnati since the city’s glory days, and continues to serve as a center of spiritual growth on a national level, providing service and education to the public. With its grandiose granite exterior, soaring height, and expansive 76 acres of landscaped grounds, the Athenaeum is certainly a Cincinnati treasure, and one that continues to serve its community in numerous ways. Founded in the early 1800s by Bishop Edward Fenwick, Mount St. Mary’s of the West ranks as the oldest Catholic seminary to the west of the Appalachian mountains, and the third oldest in the United States. Formerly known as St. Francis Xavier seminary, its illustrious history has paid witness to the leadership of a multitude of Church leaders and endured the test of time to become a center for religious education in the America. The current structure, constructed in Mt. Washington in 1929, houses a number of invaluable facilities such as the Eugene H. Maley Memorial Library, which houses over 114,000 texts, including a collection that dates back as early as the 13th century. The Chapel of St. Gregory the Great is adorned with valuable works of art, including two significant oil paintings, as well as seven mosaics from the Vatican Studios, which were gifted to the Athenaeum in the 1950s. To President Fr. Benedict O’Cinnsealaigh, the Athenaeum is meant to be a place for members of the community to gather together in faith and education – not a place for religious to be removed from the rest of the world. 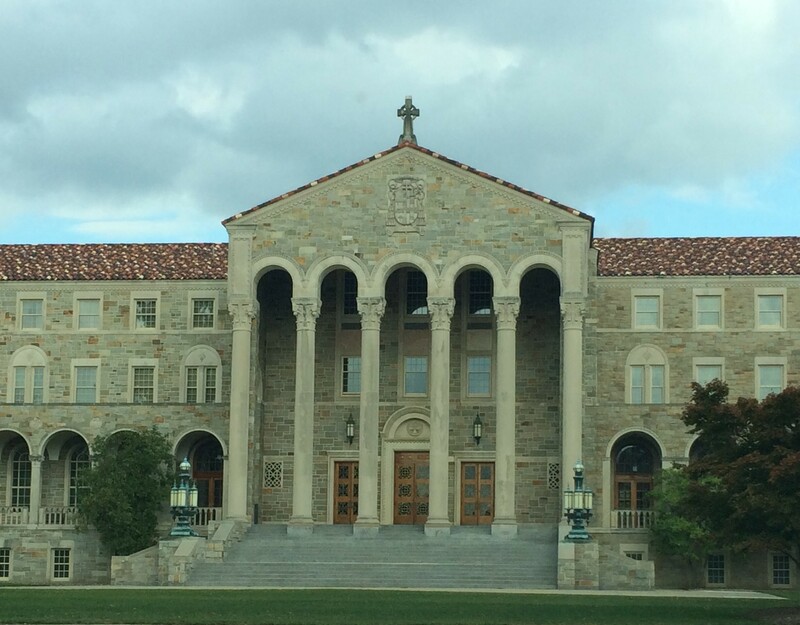 Mount St. Mary’s, the seminary division of the Athenaeum, trains men to be priests, the Lay Pastoral Ministry Program aids in the formation and education of lay ministers, and a third program offers a more general Catholic education for men training to be deacons, and those who wish to pursue a Master’s Degree in Theology, Biblical Studies, or Philosophy. For years, aspiring priests and knowledge-hungry laity have flocked to the Athenaeum for a comprehensive education in the theological and pastoral studies. This year, the seminary is nearing its capacity at an enrollment of 66, leaving only three spots available in the current class – something that has not been seen since 1989. Fr. Benedict recently attended a meeting of seminary rectors in Chicago, where those in attendance unanimously agreed that in seminaries across America, enrollment is on experiencing a significant rise. As a response, institutions like Mount St. Mary’s have begun renovations on their facilities, so as to provide for an increase in vocations. Located only a few blocks away from the Athenaeum, McNicholas has been given the unique opportunity to host a number of seminarians who have chosen to practice their ministry within the field of education. Since 2013, McNicholas Theology Department Chair Sam Roflow has worked alongside Fr. Dave Endres, Co-Director of Field Education at the Athenaeum, to bring seminarians into McNicholas classrooms. The established program allows teachers to act as mentors to seminarians, who develop their skills by teaching 15 class periods per semester. This year, seminarians Jarred Kohn, David Webb and Jacob Willig will be working with Theology teachers John Norman, Teresa Davis, and Mary Beth Sandmann. A more detailed history and overview of the Athenaeum and its many programs can be found on their website.